There are many ways to get to and from Catholic Memorial School. Our administrative team offers a number of options to get you safely to campus every day. Catholic Memorial School’s location has always added an important piece to the school’s culture. Nestled on Baker Street in West Roxbury, CM has always attracted a diverse student body. The 2018-2019 school year will welcome students from over 60 different cities and towns in the state of Massachusetts. Every day students travel from neighborhoods as close as Roslindale and as far as Plymouth. This diversity of backgrounds is part of what makes CM such a special and unique community. CM is fortunate to have a variety of options for our students to travel to school each day. In addition to MBTA bus service and commuter rail options, CM also provides our families the opportunity for private bus service. Below you will find some important information about our Bus Service along with a link to register. If you have any questions about your transportation options please feel free to contact Vice Principal of Grades 9 and 10 Andrew O’Brien at (617)469-8015. CM works with 3rd party vendor to provide transportation services during the 2018-2019 school year. The cost of CM round trip transportation service is $1,600. One way service is $950. Students needing periodic transportation service will pay for a $10 single ride ticket. 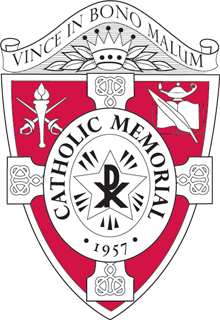 Catholic Memorial partners with Ursuline Academy in providing pickups and drop-offs for CM/Ursuline families. Rules & Regulations: As stated in the CM Parent/Student Handbook, Catholic Memorial Rules of Conduct are enforceable on the bus. Any students breaking these rules will be disciplined by CM. CM reserves the right to refuse service to students who violate the Rules of Conduct. Families will not be granted refunds for students removed from the CM Transportation Service.